The analytics landscape has totally transformed. Big data, the cloud, an increase in processing capability, and the near ubiquitous availability of algorithms are driving this transformation, but businesses are lagging far behind. 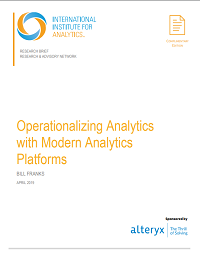 Understanding the full scope of a modern platform is the first step to drastically improving your analytics processes. Read the latest research from the International Institute for Analytics to learn more. "Alteryx est intuitif et interactif ... a pris moins de 60 secondes pour obtenir la même sortie qui a pris des heures auparavant."